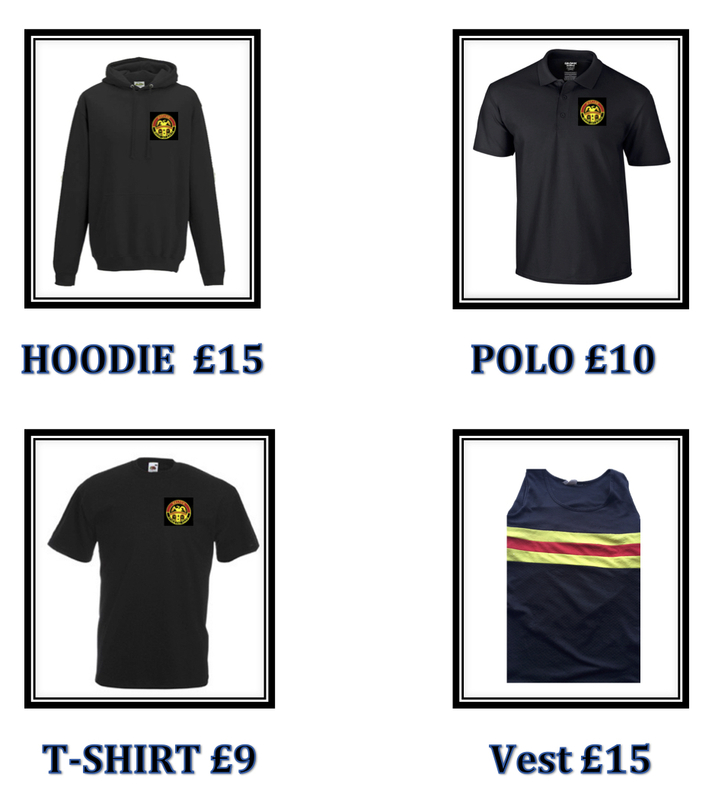 We sell a range of athletics kit with a quality embroidered logo on the hoodie, polo shirt and t-shirt, and all are fantastic value. The polo shirt is available in white or black in certain sizes. General information for track and field competitions. The Club is involved in a number of Leagues, which cater for all age groups and abilities. Athletics is organised into age groups, which differ from what juniors will be used to at school. There are many rules governing athletics, the basics are as follows. School years 4 and 5 are under 11s. School years 6 and 7 are under 13s. School years 8 and 9 are under 15s. School years 10 and 11 are under 17s. You must be under each particular age on the 1st of September in the competition year to be able to compete in each respective age group. The number of events an athlete can compete in is limited to 3 events plus the relay. There are limits on the number of distance events an athlete can compete in on one day. For under 20 age group the athlete must be under twenty on 31 December of the competition year. Under 20s may compete in five events on one day. Each age may compete in the the age group above them. Under 17s and under 20s can compete as seniors. string will automatically become the A string. The A and B string will normally be of equal importance to the team as they will score equal points. In some competitions there will be non scoring events. These competitions offer opportunities for improving athletes, who cannot make the team in a particular event, to show what they can do and experience the atmosphere of a competition without being under pressure. In addition to league matches there are ‘Open meetings’. These meetings are open to anyone, provided there is a competition in their particular age group. A small entrance fee will be charged by the promoting Club. In some meetings medals are awarded for the first three places. These meetings are usually well attended and can be extremely competitive. They can be found advertised in Athletics Weekly and on the internet. The Surrey County Championship, Regional and National Championships are open meetings, but they may have minimum entry standards. Intercounty Championships are by invitation, to qualify you will need to be number one or two on the County rankings. You may never have heard of him, but it is largely thanks to his genius that our lives are so intertwined with computers. Alan Turing, a pioneering 20th century mathematician, is widely considered to be the father of modern computer science. It was his idea of creating a machine to turn thought processes into numbers, which was one of the key turning points in the history of electronic boxes and screens. Turing was born in London in 1912 into an upper-middle class family and displayed a fascination for science throughout childhood. He was regarded as good, but not exceptional at primary school, but developed an interest in chess. When he joined Sherborne public school in 1926, he cycled 60 miles from his home to school. School developed his athletic ability, which was to prove as excellent as his intellectual ability. He later became a member of the Walton Athletic Club setting records in the 3 and 10 mile championships and he came 5th in the A.A.A. Marathon in 1947 – he almost qualified for the British team in the 1948 Olympic games. While reading maths at King’s College, Cambridge, in the 1930s, Turing spent much time reworking earlier scientific principles and developing his most significant mathematical theories. Despite his brilliance, he suffered from a feeling of isolation, and found it difficult to make friends. After graduating, Turing was elected a fellow of Kings, and worked at Princeton in the US, where he began work on what was later to become the first digital computer programme – the "Turing Machine". His revolutionary idea was for a machine that would read a series of ones and zeros from a tape. These described the steps needed to solve a problem or task. But it was not until nine years later that technology had advanced sufficiently to transfer these ideas into engineering. Turing’s experiments are credited with helping Britain win World War II by deciphering encrypted German communications, helping the Allies remain one step ahead. The wartime German computer Enigma generated a constantly changing code which was impossible for people to decipher. But Turing’s creation of Colossus – one of the first steps toward a digital computer – managed to crack Enigma’s codes, giving the Allies the break they desperately needed in fighting Germany. After WWII, Turing took up long-distance running to relieve the stress and obtained record times in races in the Walton Athletic Club. He went to work for the National Physical Laboratory and continued research into digital computers including developing the Automatic Computing Engine. On June 7th, 1954, in Wilmslow, Cheshire, Turing died while experimenting with electrolysis. Potassium cyanide was found on a partly eaten apple beside him. The inquest stated that he took his own life. Whilst accident and even assassination cannot be ruled out, it is more likely that the frustrations of his secret work lead to his untimely death and the strong symbolism of the partly eaten apple, no coincidence. When he died, Turing left the world a permanent legacy. Computers have revolutionised so many aspects of our world that today it is hard to imagine life without them. Looking back, he was the typical absent-minded professor. He looked different to the rest of the lads; he was rather untidily dressed, good quality clothes mind, but no creases in them; he used a tie to hold his trousers up; if he wore a necktie, it was never knotted properly; and he had hair that just stuck up at the back. He was very popular with the boys, but he wasn’t one of them. He was a strange character, a very reserved sort, but he mixed in with everyone quite well: he was even a member of our committee. We had no idea what he did, and what a great man he was. We didn’t realise it until all the Enigma business came out. We didn’t even know where he worked until he asked us if Walton would have a match with the NPL. It was the first time I’d been in the grounds. Another time, we went on our first ever foreign trip to Nijmegen in Holland he couldn’t come, but he gave me five pounds, which was a lot of money in those days, and said "Buy the boys a drink for me". With the 2006 Commonwealth Games due to start shortly in Melbourne we were asked whether any Walton athletes had been to the Commonwealth Games. The answer is a resounding yes. A total of six Walton athletes have represented their country at the Commonwealths. This may not seem many but they have brought back an amazing total of three titles, five other medals and another four top six places. The first to appear at the Games was, appropriately enough, Walton’s first ever international. Sprinter Les Lewis was selected for the 1950 Games in Auckland, New Zealand. Les was a 440 yards specialist who also ran the shorter sprints and was selected for all three and for both relays. Les made it to the semifinal of the 100 yards and came 4th in 10.0 just missing out on the final. He was unfortunately disqualified in the heats of the 220 yards but in his main event he comfortably qualified for the final and then ran 48.0 to claim the silver medal only a tenth of a second behind the winner. Les then helped the England team to silver medals in both relays, 42.5s for the 4 x 110 yards and 3.19.3 for 4 x 440 yards behind the australians in both cases. Les presumably enjoyed his time in Auckland because he later emigrated to New Zealand. The 1954 Games were in Vancouver in Canada and three Walton members were selected by England. They all came back with medals and picked up three titles between them. Chris Chataway, probably Walton’s best known old boy, won the 3 miles in 13.35.2. Ken Wilmshurst was a double gold medal winner in the long jump (7.54) and triple jump (15.28). Ken also reached the final of the 440 yard hurdles, finishing 6th in 56.3 having run 55.4 to qualify. Walton’s third representative was thrower Mark Pharoah. Mark picked up the bronze medal in his main event, the discus, with 47.84. He also finished 6th in the shot (14.27) and 10th in the hammer (44.82). The 1958 Games were in Cardiff. Ken Wilmshurst again competed in the long and triple jumps. He long jumped 7.07 for 11th place, having jumped 7.28 in qualifying. In the triple jump he improved on his Vancouver performance with 15.40 but the event had moved on and this was only good enough for 5th place. Walton had another athlete at Cardiff, Marion Needham. Marion was our first female international and is still the club long jump record holder with 5.87. At Cardiff she jumped 5.69 for 5th place. There followed a long break before the next (and the most recent) Walton athlete to appear, Paul Edwards was selected for Wales in the 1990 Games in Auckland and threw 18.17 for a bronze medal in the shot. That last appearance was 16 years ago, lets hope it won’t be as long before we see another Walton member competing at the Commonwealth Games, perhaps it’ll be you!